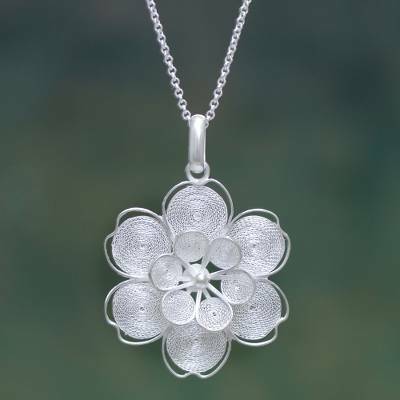 Sterling Filigree Artisan Crafted Peruvian Flower Necklace, "Filigree Jasmine"
Crafted by hand, filigree petals depict a glorious flower. This beautiful necklace by Carlos Yauri is graceful and feminine. "I met my wife thanks to my life experiences and working environment, and together we have forged a life dedicated to filigree art." "My work is an art form I enjoy developing because it challenges my artistic skills. Filigree is hard work, but my patience and dedication serve me well when I am working on new designs. "I was born in Oroya, in the Junin Department, I trained as a silversmith in San Jerónimo de Tunan, where my mother was born and a place I love. I was an apprentice to some of the most renowned master silversmiths of the region. I eagerly learned all I could from them and gradually, as I honed on my own skills, my jewelry became impeccable. So much so, that I started to develop my own collections. "I think of myself as a happy, responsible and hardworking person and these traits served me well when at 18 years of age I faced the challenge of becoming an independent artisan. I am now in a more stable position and I am proud of what I have achieved, especially the awards I have received and among them is the Filigree Award at a national competition sponsored by Peru’s patronato de la plata (silver association). "Our workshop is pulling through thanks to the conjoint efforts of my family and my team. Our designs are inspired by our natural environment as well as by our culture's customs, and these are represented by our prime material: silver. "I met my wife thanks to my life experiences and working environment, and together we have forged a life dedicated to filigree art. We share our passion, experiences and love for this art through each of our designs. We hand craft our designs at our workshop, always making sure we attain the high quality our customers deserve."